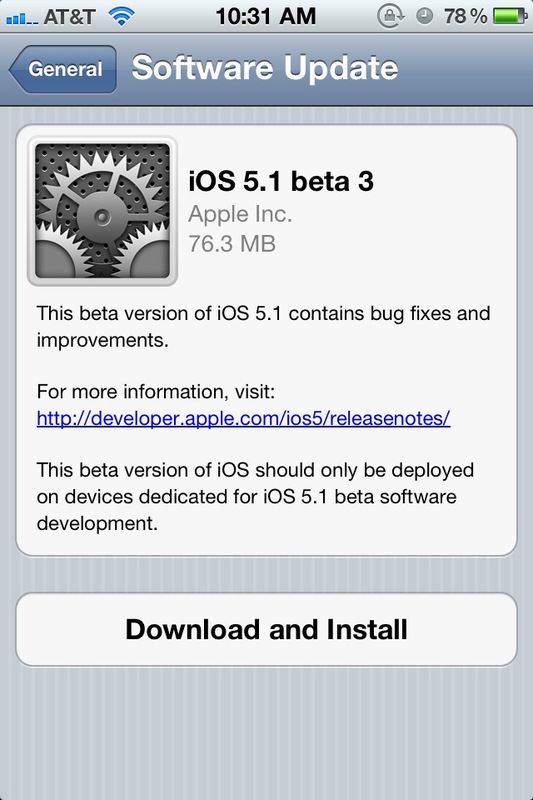 Apple just released a third beta version of the upcoming iOS 5.1 firmware (Build 9B5141a). The software is available as an over-the-air update for existing iOS 5.1 beta users, but is not yet available (update: now available) as a standalone download through Apple’s developer portal. As you might imagine, it contains the obligatory bug fixes and improvements. According to the tips we’ve received, it also restores the Enable 3G toggle in the Settings app which has been strangely absent on the iPhone 4S since it’s mid-October release. This should help save battery by switching to Edge connectivity in order to maintain cellular data for applications that do not require high data throughput. iPhone 4S users are currently forced to choose between having 3G cellular data turned on, which decreases battery life, or turning off their cellular data connection altogether. According to our reader Jan who blogged about it, iOS 5.1 Beta 3 contains strings for Siri in Japanese. Apple wrote in the Siri FAQ that “In 2012, Siri will support additional languages, including Japanese, Chinese, Korean, Italian, and Spanish”. Release of iOS 5.1 Beta 3 comes barely a month after the company seeded the second beta, which revealed the ability to delete individual images from Photo Stream. iOS 5.1 Beta 2 also revealed that Apple could be planning to soon ship iPads and iPhones with quad-core A-series of in-house designed chips. By some accounts, the company could release the iPad 3 with a quad-core chip in March —followed by the iPad 4 in October.